EDGE is an entirely volunteer-run organization. That means that there are no paid employees, everyone who helps EDGE does it from the bottom of their heart to try to make the seminar as Outstanding as possible. EDGE is always looking for volunteers to help in a variety of capacities, so please continue to get involved to find out more! The EDGE Board meets every other month and oversees the overall mission, vision and values of the Seminar. The board is responsible for fundraising, recruitment, publicity and every other major aspect of the Seminar. The Planning Committee also meets once a month and is in charge of the more specific details of each year's seminar, such as the program, booking speakers and panelists, the schedule and the seminar team leaders, JCrew and operations staff. Group leaders are extremely vital to the seminar, they are the ones who are responsible for guiding a group of sophomore students towards getting the most our of the seminar, and bonding as a group. The seminar can be life changing for the adults too! Team Leaders must be 21 years or older and have experience working with youth. The JCrew (Junior Crew) are paired with a team leader for a group during the seminar. They act as a junior Team Leader and try to bridge the gap between the student and the adult Team Leader. JCrew members must be alumni from the previous year's seminar, and must meet the requirements set forth by EDGE, including 100 hours of community service. And most importantly, JCrew members are responsible for providing the youthful energy to heighten the seminar to the amazing level that it achieves. The Operations Staff are responsible for running the nitty gritty details of the seminar, from scheduling the locations and room assignments, to shooting film and photography, maintaining legal documents, printing forms, and organizing all of the speakers and panelists. We are looking for inspiring leaders in the non-profit and for-profit sectors to volunteer their time to speak at EDGE and motivate our participants to discover their own passions and take action in their communities. Past speakers have included Executive Directors of non-profits, school administrators, Congresswomen, actors, CFOs of large corporations, and young social entrepreneurs. When you speak at EDGE, you have the opportunity to literally change the lives of these young leaders, and you will be just as affected and motivated by their enthusiasm as they are by your inspiring story. 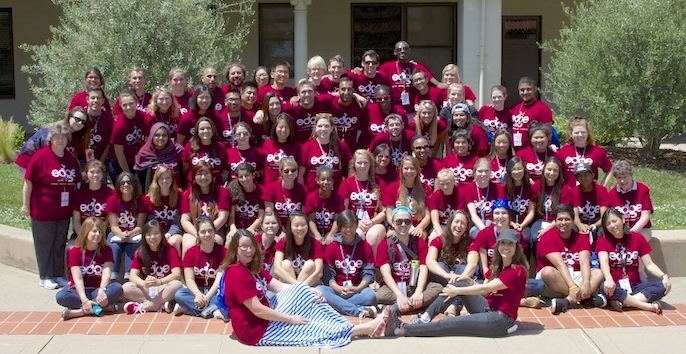 EDGE Youth Leadership is a 501(c)(3) nonprofit. Please contact us with any questions.